“Shocking” fact: Electric units are (typically) rated in kilowatts, A Kilowatt (1000 watts) is equal to 3,413 BTUs. When fossil fuel prices are high , electricity is often feasible for radiant heat. Standard electric water heaters suffer from slow recovery rates, but electric boilers don’t. For large radiant systems, a 100-200 Amp service panel is dedicated to the boiler and this adds to installation costs. But, if rates in your area are below .07 kwh, electric water heating may be cheaper than gas or oil. Since electric boilers don’t require venting, no BTU’s are dumped up a flue stack. This may translate up to 100% efficiency. We offer the Electro-Boiler for CLOSED radiant systems & Rheem electric on-demand water heaters for OPEN radiant systems! These “wall-mounted” units are compact & extremely efficient! Electric on-demand heaters can also be used for OPEN systems, providing both floor heat and domestic hot water. Heat source efficiency is calculated by taking the heating unit’s BTU input, multiply that number by it’s efficiency,…This equals the unit’s BTU output. Example: 100,000 BTU unit with a 98% efficiency has an output of 98,000 BTUs. (100,000 X 98% = 98,000) Contact a Technician for details. The fireboxes of these units utilize an internal ASME certified stainless-steel coil, where water is heated and sent to a holding tank (for domestic hot water) or directly to an open (domestic and radiant floor) or closed (floor heat only) radiant floor system. During normal operation these units also heat the room very much like a standard parlor stove. Our customers report that the heat output is about a 50/50 mix, that is, half the BTU’s from the stove go to the coil for heating water, the other half heats the room directly. Although we don’t sell the heat sources shown below, we’ve received lots of positive feedback from customers who use them. Of course, you’ll want to do some research to be sure the following units are appropriate for your situation. Geothermal heat pumps are becoming an increasingly popular method of heating water. They transfer heat from the earth’s warmth into your home in the winter. They’ve been used quite successfully in conjunction with radiant floors and, like solar, are very environmentally clean and efficient. 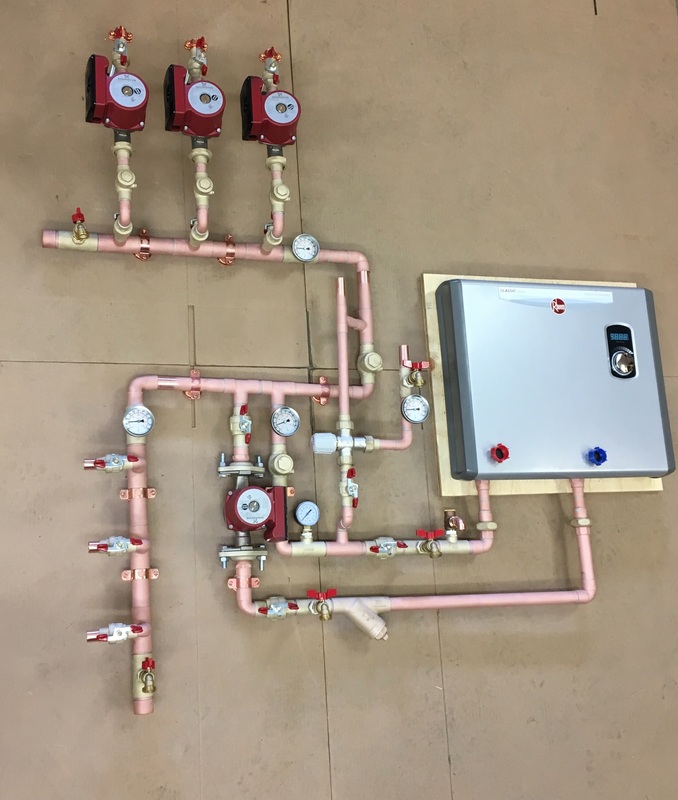 Check out www.ecrtech.com if you are interested in this method of water heating. The gasification boiler is a unique approach to indoor/outdoor wood boiler design. There are various configurations, but most utilize special converters, refractory chambers, and fan-induced high temperature pyrolysis (near 2,000-degrees F) to convert cordwood into gas. This extracts maximum BTU’s from the solid fuel. A fine fly ash is all that remains and there’s very little particulate output during this efficient combustion process. With the new EPA Qualified Wood Gasification boilers, everybody can love them. They dramatically lower smoke emissions and they use 50% less wood while heating your home, business, domestic hot water, greenhouse, hot tub…you name it. Mine even heats a waterbed. Currently, this type of wood boiler is required in VT, NY, NH, MA, ME, MD, RI, IN and PA. But due to the high smoke emissions and inefficiency of the old-style wood boilers, many other states are likely to mandate the gasification-type units for all future wood boiler installations. Of course, it goes without saying that utilizing an indoor or outdoor wood boiler with radiant heat is very energy efficient.